Meal prep away from home can be quick and easy. Try this nacho appetizer that is (almost) homemade and totally delicious. We hit the road early on Friday morning for a long weekend away from home. Somehow Mammoth Lakes and the surrounding Eastern Sierras have an amazing effect on us. We love it here. Slowly, we’re figuring out this vacation thing: where to stay, what to pack, what to eat. As I mentioned yesterday, I tried to meal plan appropriately for our dining experiences by packing enough good food to last us the duration. But what if you want to make something on the spot? To buy groceries on the fly, away from your fully stocked kitchen and the seasonings, oils, and vinegars that you take for granted can be challenging. Think about when you go camping, visit the in-laws, or head out on vacation. Consider those times when you’re supposed to bring an appetizer to the party and a myriad of circumstances prevent you from having it ready in time. You might be tempted to buy ready-made in those situations, but you know they won’t taste as good as homemade. My conclusion is to stock your freezer so you always have ready-to serve meals or develop recipes that need little prep and easy-to-use ingredients. Enter the Easy Nacho Appetizer Away from Home. I shared this pan of hot, cheesy goodness with my hubby while we watched the football game this afternoon. It’s so good, I’ll probably make it again at home. But, know that you can make it anytime you need something quick and easy. I brought some of the ingredients along with us, but others I picked up at the store like the ready-made salsa. You could make this from scratch, or just grab some cans and jars when you’re away from home and your fully stocked kitchen. I imagine that you could even make this over a campfire instead of a broiler. The smoky flavor would be awesome. If you try it, let me know how it goes. In an oven proof baking dish or saute pan, spread the refried beans. Spoon the sauce over the beans. Sprinkle the cheese over the sauce. Broil for 3 to 5 minutes until beans are hot and cheese is melted. Place chips around the edges of the dish or pan. Top the beans with red onion, sour cream, avocado, and salsa. Got a favorite recipe that can be made in a flash? 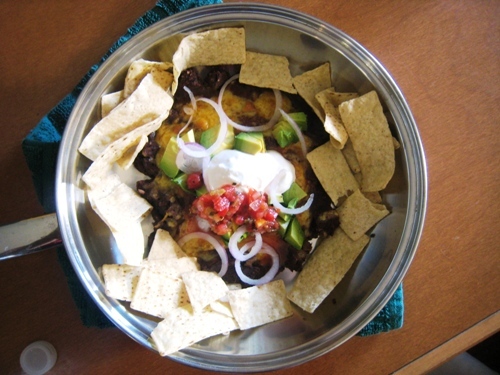 Going to try this tomorrow as “tailgate nachos” using our portable propane grill. Going to line a round cake pan with foil and layer everything in and then heat it up at the car show. Hope it turns out awesome!